What does my order look like when it delivers? 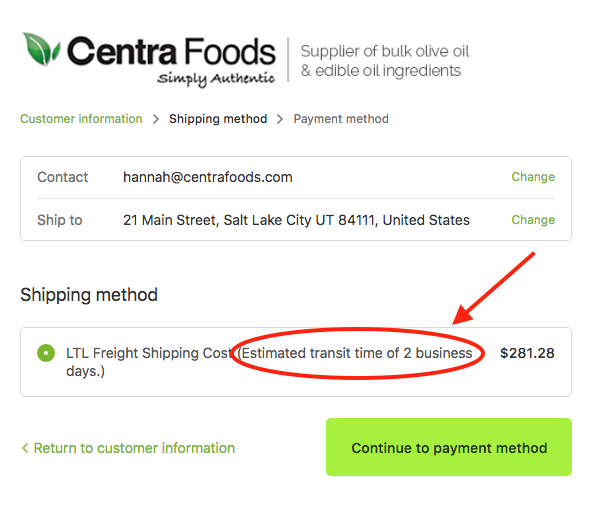 How quickly do orders ship out from Centra Foods? Do I need to be at home when the shipment delivers? Does the freight truck come with a lift gate? Can the driver bring the oil into my garage or home? If I buy olive oil, will it always taste the same? My oil was solid or cloudy when it arrived. What’s wrong with it? I don’t have a fork lift. Can I still buy drums or totes? What do I do with the packaging when I’m done with it? Can I buy from a sales person instead? I buy a lot of oil. Can I get a special discount? Placing an order on our online store is easy. We've provided step-by-step instructions walking you through placing an order on our How To Place An Order page. Your order will come loaded onto a pallet. This pallet is usually about 40” x 48” (or about 3 1/2 wide x 4 ft deep). Depending on the packaging that you choose your pallet may vary in height. For example, twenty 35 Lb. Containers will be stacked onto a pallet in one layer that stands less than two feet high. In contrast, full pallet of 60 35 Lb. Containers or a 275 Gallon Tote may about 4 1/2 feet tall. All 35 Lb. Containers will come shrink wrapped to the pallet for safe transport. Drums will be secured using bands. Most pallets you receive will be wooden, but the plastic caged totes come with a built-in pallet. These pallets are shipped using a 3rd party LTL (Less-Than-Truckload) freight carrier and your order will arrive on an 18-wheeled truck. We can deliver to most homes and businesses throughout the continental US (excluding Alaska & Hawaii). Your order will be very heavy — the pallets weigh anywhere from 800 lbs (for a partial pallet of 20 35 Lb. Containers) to 2,250 lbs (for a full pallet of 60 35 Lb. Containers). The full pallets (especially totes and drums) can’t be moved safely without a fork lift or a pallet jack. You can, however, separate the cases on a 35 Lb. Container shipment to move them into storage by hand; each of this individual boxes weigh about 37 lbs including packaging. At Centra Foods, we try to pack and process orders efficiently. All in-stock orders will ship out between 2-3 business days after receipt of the order. If we are out of stock on a particular item, it will not be available to ship. Some items may come back into stock quickly, but others may take a few weeks or months depending on crop/seed availability. All orders ship from our facility in Kent, Washington, located about 20 minutes outside of Seattle. Depending on where you live, shipping can take anywhere from 1-9 business days (or 1-2 weeks) in transit. Most orders will be processed and leave our Kent, Washington facility within 2-3 business days. You will get an estimate of how long your order may take to deliver during the checkout process. For example, shipping one pallet to from Kent, Washing to Salt Lake City, Utah is estimated to take 2 days. In comparison, shipping from Kent, Washington to Gorham, Maine is estimated to take 7 days. In our experience, these transit estimates do not factor in the pick up or the delivery days, so please plan for at least two extra days — if not more. These shipments may be further delayed due to bad weather, truck breakdowns or driver availability, so it’s always helpful to plan ahead. These shipments do not have a “guaranteed delivery” on a certain date and the estimated delivery dates are subject to change. 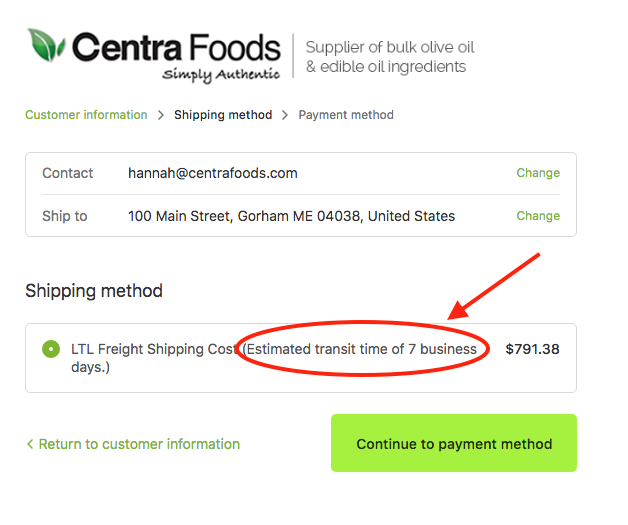 If transit times do change, Centra Foods is not liable and order returns are not available as a result of freight delays. Please plan orders far in advance to allow for ample delivery time in transit. When it comes to LTL freight shipping, there are a lot of factors out of your (and Centra Foods’) control. Yes, authorized adult over 18 will need to meet the driver at your address when he delivers, whether you are in a corporate manufacturing plant or at your home residence. Our drivers will make an appointment with you using your contact information that you provided on your order. You should receive a 4-5 hour block of time in which the driver will arrive. Please make sure that you are on the premises when the driver arrives. If you are not home, they will not deliver your product; instead, it will return to the terminal and they will need to re-deliver. Upon the second delivery attempt, if you are still not available, the driver will be instructed to leave the freight and your opportunity to review for damage will be lost. Returns due to damage will not be available in this case. Yes, your shipment will come with a lift gate in case you need it. A lift gate is a tool located at the back of the freight truck lower the pallet from the back of the truck (4 feet up in the air) to the ground. Without a lift gate, pallets can be cumbersome (or impossible) to unload at a residential / small business location. A lift gate is used if you do not have a commercial loading dock and/or a fork lift at your facility. This tool is necessary for most home deliveries, where the truck will lower the pallet from the back of the truck to the end of your driveway or onto the street. You will be responsible for moving the pallet from the drop point to its final storage space. This freight delivery does not include bringing the pallet inside a pallet or home. The driver will leave your pallet in the safest location for the truck given your neighborhood, street and turn around space. You will be responsible to move the pallet (or individual boxes) into your garage, home or commercial facility. No, in home delivery is not included in bulk freight shipping. The driver will leave the pallet in the safest location for his truck given your neighborhood, street and turn around space. You will be responsible to move the pallet (or individual boxes) into your garage, home or commercial facility. If you order 35 Lb. Containers, each of these boxes can be moved by hand into your storage space, as they only weigh about 37 lbs each. The drums and totes, however are between 500 - 2250 lbs and are not safe to move without a forklift or pallet jack. Please do not order this larger bulk packaging unless you are working in a commercial facility with these tools. Returns will not be available. Shipping is a custom cost based on multiple factors. It takes into account the address you are shipping to, the packaging type you are receiving and total number of pallets being shipped. The custom shipping cost is calculated during checkout, once your delivery address has been entered. This cost will be included in your final order total, and Centra Foods will arrange the shipment with the carrier to your address. There is no “one best oil”. The right oil for you will depend on the application you are using it for. To learn more about each oil and it’s best uses, please visit our Resources Library. You can also look through our Articles Library— this page links to hundreds of articles providing information on different types of oils, including their features and benefits. Olive oil is a natural product, and the taste profile and color can vary slightly with each lot. This may be the case, even if the oil is coming from the exact same trees! Our oil lots are constantly rotating, so you won’t receive exactly the same lot you did at your last order. The color and flavor will be subject to change. Not to worry though — no particular color of olive oil denotes a better quality. Similarly, olive oils can come in lots of different flavors: some olive oils are peppery while others are buttery. The taste and color of the oil has a lot to do with the varietal of olive that it was produced from. We work with farmers around the globe, and the varietals of olives and the corresponding flavor profile and color may change. Good news — nothing is wrong with the oil! This happens to all oils in the cold, especially in the winter months. Even if it’s not cold where you are, your order may have passed through a colder region in transit. All oils turn solid — like butter — at a certain temperature. Olive oil is especially prone to this. If the oil is cloudy, it is likely in the very early stages of freezing/solidifying in the cold. To bring it back to it’s normal liquid state, bring the oil into a warm space or put the jug in a hot water bath. This should bring it back to a normal liquid consistency, and the quality of the oil is unaffected. Sometimes oil particles can settle in the freezing/dethawing process, so you may want to turn the jug over a few times to mix it up before use. If you have purchased the drums or totes, provide a few days for the oil to de-thaw. Choose a packaging type that you are familiar with and that you can move safely and comfortably around your facility. If you are working out of your home or you own a small business, we highly recommend the 35 Lb. Containers. These can be carried by hand (they weigh about 37 lbs each including the packaging) and we can deliver with 20 or 60 on a pallet. Keep in mind, the driver will not be able to deliver these inside your home/facility, so you will be responsible to move them into their final storage place. If you are in commercial manufacturing facility, oil can be ordered in the smaller 35 Lb. Containers or in the larger bulk 55 Gallon Drums or 275 Gallon Totes. These larger packaging sizes weigh 500-2250 lbs each, and you will need a fork lift or pallet jack to move them around your facility safely. We don’t recommend buying drums or totes unless you have fork lift or a pallet jack at your facility. Without these tools, it will not be safe to move and use the pallets. For food safety reasons, we don’t readily accept returns. Order returns will not be available if you buy packaging that your facility is not set-up for, so please choose a packaging option that you know will work safely and efficiently in your space. All packaging is yours to keep. We do not offer return programs for drums and totes purchased online at this time. In our experience, we’ve seen used drums/totes be picked up by a local commercial recycler, sold to local companies/people for re-use or they may be disposed of. Working with one of our experienced account managers is also highly suggested if you have questions about oils, packaging, or need quality documents for your food manufacturing facility. We can also offer contracted pricing for larger volume customers. If you buy 2+ full pallets per month, we'd recommend working directly with one of our experienced account managers. They will help to provide custom discounted pricing, coordinate your orders and be a guiding hand to provide updates and answer questions.